TWO players who became major stars and a legendary coach complete the 2015 awardees that will be feted in the Collegiate Basketball Awards presented by the UAAP-NCAA Press Corps and Smart Sports on January 26 at Saisaki-Kamayan in EDSA. San Beda’s Art dela Cruz and University of Santo Tomas’ Ed Daquioag are slated to receive the Impact Player awards even as the group of scribes covering the collegiate beat honors legendary coach Aric del Rosario with the Lifetime Achievement Award. Arellano University’s Jiovanni Jalalon and La Salle’s Jeron Teng will also be cited in the event supported by ACCEL Quantum-3XVI, Gatorade, UAAP Season 78 host University of the Philippines, NCAA Season 91 host Mapua, San Miguel Corporation and the Philippine Sports Commission. Jalalon will be recognized with the Accel Court General citation, while Teng will receive the Gatorade Energy Player award. Dela Cruz and Daquioag became two of the best players in college basketball during the past season when they led San Beda and UST to runner-up finishes in their respective leagues. Del Rosario, on the other hand, joins former San Beda high school mentor Ato Badolato in the list of personalities who won the award for his major contributions as coach of UST’s UAAP four-peat run from 1993-1996 and his recently-concluded stint with University of Perpetual Help in the NCAA. Leading the list of awardees are FEU’s Nash Racela and Aldin Ayo, the former Letran mentor now with La Salle, who will both receive the top coaching honors after steering their teams to the championship. 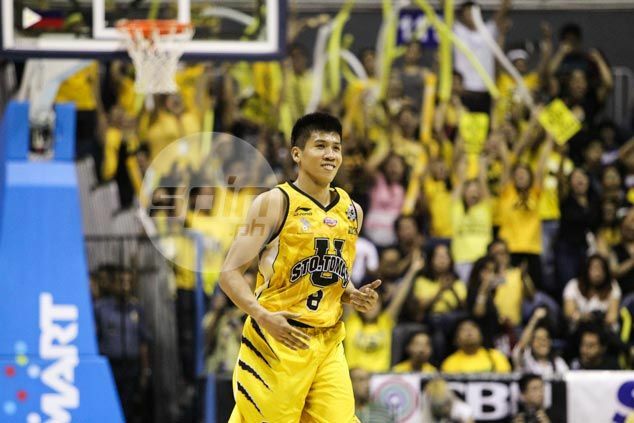 Composing the Collegiate Mythical Five are Ateneo’s Kiefer Ravena, Mapua’s Allwell Oraeme, Far Eastern University’s Mac Belo, UST’s Kevin Ferrer and Perpetual’s Scottie Thompson. They are also candidates for the Smart Player of the Year award. Other awardees are FEU’s Roger Pogoy and Letran’s Kevin Racal (Pivotal Player) and San Beda’s Baser Amer, Letran’s Mark Cruz and FEU’s Mike Tolomia (Super Senior).